New Liverpool co-owner George Gillett will not discuss the size of the club's summer transfer kitty but has promised to back manager Rafael Benitez. Newspaper reports have suggested Benitez will be given £40m to spend but Gillett would not be drawn on a figure. "Rafa has been very good about his plan but we won't discuss that publicly," said Gillett. "We hope to build a winning tradition - that means building something for the long term so we can be successful." 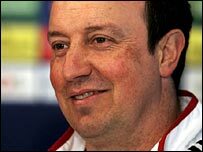 Benitez met Gillett and co-owner Tom Hicks over the weekend to discuss their strategy for an assault on the Premiership title. "We talked about ideas for the future and it was good. For me, the future of the club is brilliant," Benitez said. "They (Gillett and Hicks) said that we will go in the right direction." The Liverpool manager has been linked with a whole host of players, including Sevilla winger Daniel Alves, Barcelona striker Samuel Eto'o and Valencia forward David Villa. Benitez is in his third season in charge at Anfield, while Gillett and Hicks have made serious investment during previous forays into ice hockey and baseball in the United States. They have also concluded a deal for the Reds' new stadium following a meeting with Liverpool City Council. Work on the new ground in Stanley Park will begin in May and will be completed by the end of 2010. The new ground was initially set to hold 60,000 but Gillett and Hicks are reviewing the plans and could extend the capacity. However, Gillett said the rethink was not just to try to compete with arch-rivals Manchester United, who have a capacity of 76,000 at Old Trafford. "I think we have to be economically competitive - it is not to be larger than Old Trafford or smaller than Old Trafford," Gillett told ITV1. "Arsenal have set a new standard on game-day revenue - they set a new standard on quality and revenue. "We want to be competitive. We don't want to fall behind."